Fortunately, due to the wonders of modern technology I am able to continue to work with clients who've moved away who now live all over the country and around the world via phone and/or video sessions (via Skype or Google Hangouts). The other day I was going through some old grad school papers and I found the following short paper I wrote as a MFT student in 1996 when I didn't have very much experience working with adolescents. Looking back on it now 17 years later, even though I've certainly learned a lot since then as a specialist working with teens, I'm happy to say I was definitely on the right track. Q&A for Pros: Recommendations for a 12-year-old Who Lies and Steals? Quick question about a 12 year old who was adopted and was sent away for a serious lying/stealing problem. These behaviors have not surfaced completely since he came. I wondered if you had any recommendations for literature for him to read that might speak to his lying/stealing? Q: From a colleague who runs a residential treatment program for youth: Hey, Jonathan. Just a quick question about one of my clients. He is a 12 year old who was adopted and was sent away for a serious lying/stealing problem. These behaviors have not surfaced completely since he came. I wondered if you had any recommendations for literature for him to read that might speak to his lying/stealing? A: I don't have any literature specifically for 12-year-olds on this topic, though I'm sure if you did an Amazon search you would find some therapeutic titles for latency age kids. However, unless he's insight-oriented (most 12 year olds aren't), I wouldn't expect a bibliotherapy approach. I would be looking at finding out what his goals are using motivational-interviewing/solution-focused approaches to help him identify his goals on becoming more honest. That in addition to whatever work your program already does to address his unresolved past issues, current family dynamics and parenting strategies. Certainly any recreational/experiential delivery methods will help integrate these issues more than direct talking-based therapies or reading on his own. Also, as you said, "these behaviors have not surfaced completely since he came" is no surprise, since from a systemic perspective he's no longer in his native home system where his lying/stealing may have served a purpose (the function of the problem) for him in that system. This is one of the problems inherent in treating the child and not treating the system (the family) around the child. Make sure the family is part of the treatment process. Q&A: How much does it cost to get a master's in MFT? Practice Builders for Pros For colleagues improving their skills and practices and for students and potential students considering the therapy field. A: Quick answer--a lot! ;-) Actually I don't recall exactly. Varies of course. I got offered a tuition waiver in exchange for being a teacher's assistant which saved a bunch of money, and they paid a small monthly stipend. They duplicate some info. The 2nd has a lot of user comments. You'll have to contact several schools that interest you and start getting current numbers from them and start comparing. Good luck! Please share your findings for the benefit of others! Q&A for Pros: Looking for Work? Do a Networking Blitz! 1. Send a cover letter introducing himself with his resume to any/all of the treatment providers, mental health centers, rehabs, and agencies that interest him (and even the ones who don't, as you never know who will know someone who knows someone) and follow up the following week with a phone call. This may be an obvious suggestion, however, I'm always surprised by how many people don't. When I was graduating in Illinois we knew we were moving back to Utah so Kara could resume her schooling. I only knew a few people in Utah professionally with whom to network. We had no money in reserve. I needed a job as soon as I got to Utah. So this was early Internet days so I looked up what I could online, but mostly scoured a Utah County phonebook I found at the library, for every single provider (solo, group, agency, etc) I could find and mailed them all the following networking letter with my resume. I am currently exploring job opportunities in the Utah County and Salt Lake County areas. I am relocating myself and my family to Utah County where I am seeking employment as a mental health professional. I am looking forward to returning to the community where I had such rewarding experiences in the field. I am writing to you in the hope that you may be able to assist me in exploring employment opportunities with your organization or other organizations you are aware of that may have positions available. I graduated from Brigham Young University in Family Sciences in 1993. Since then my training has been in the field of substance abuse with the Utah Alcoholism Foundation and in the field of marriage and family therapy at Northern Illinois University’s Marriage and Family Therapy graduate program. I have enclosed my resume detailing my qualifications as well as my references. I will be available for an interview in your area after May 19th. Please feel free to call me if you have any further questions at (815) 756-xxxx prior to May 15th or at (801) 763-xxxx after May 18th. Any assistance you can grant will be greatly appreciated. I look forward to hearing from you. Thank you for your time and consideration. Beth Hughes with the UAMFT suggested I contact you. Last month I was able to talk with Becky at your organization and she suggested I send you my vita. I am currently exploring job opportunities in the Utah County and Salt Lake County areas. I am relocating myself and my family to Utah County where I am seeking employment as a mental health professional. I am looking forward to returning to the community where I had such rewarding experiences in the field. I am writing to you in the hope that you may be able to assist me in exploring employment opportunities with your organization or other organizations you are Daware of that may have positions available. 3. And he's already doing #3--ask everyone you know who they know... And while I don't know of any leads specifically right now I'm happy to post the need on my Facebook and Twitter and see if anyone knows anything. It may or may not yield anything, but you never know—and as of this writing POW! that's 4,700 people instantly added to his network! If there are any leads I'll forward them on to you, or your friend can friend me on Facebook and Twitter and keep an eye on these posts himself. 4. Consider the rural option. Question: Is he local, does he want to stay local or willing to relocate? There are often great jobs in rural settings/boonies and they are willing to pay more b/c a lot of people aren't willing to relocate and they desperately need providers. Further, many states have Rural Loan Repayment programs where by committing to work a min of 2 years in a rural setting he can get a lot and sometimes all of his grad school loans paid off. ASK AN MFT: I spoke to a Family Systems class at Utah Valley University (UVU) about being a Marriage & Family Therapist. I had the students ask me questions ahead of time online. What questions would YOU ask? Here are their questions (organized in topics) that we covered. Podcast coming soon: I recorded this Q&A and will post as a podcast for those who are interested in the answers I gave. See what they thought: Their evaluation results are below. More than “Just” MFT 1. What do Marriage & Family Therapists treat? What kind of clients and issues do you see and deal with on a typical day? In Session: Models & Approach 2. How do you decide which model/approach/theory to use when you meet with a couple? What is the information that is given to you from a client that directs that decision? 3. How do you show empathy to your client's problems and still be able to maintain your professionalism? 4. As a counselor do you find it more effective to help client's work out solutions to their own problems and only give them advice when they ask for it or what? Couples: Marriage Prep 6. 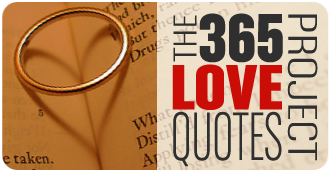 What advice would you give to a couple before they get married? What should couples know before they get married? Couples: Counseling One-Half of the Couple 7. What do you do when a couple comes in, and only one partner is trying to make their marriage work? 8. What if the other partner is stonewalling and wants nothing to do with the therapy sessions? 9. What happens with the other partner who wants to make it work? Couples: Abuse & Domestic Violence 10. When a person has experienced an abusive marriage how do you counsel the person to be able to once again trust in a new relationship? Being a Therapist: Making the Decision 11. What motivations drove you to become a marriage therapist? 12. Where did you get your MFT? 13. Is Utah a good place to do marriage therapy? How do I get clients to come to me? Being a Therapist: Passion or Burnout? 14. How do you keep from becoming too emotionally involved or just plain burned-out? Do you find it can be very emotionally draining sometimes and if so how do you cope with that? 15. Do you know if many therapists seek counseling themselves to help them deal with their profession? Being a Therapist: Impact On Your Own Marriage 16. Do you apply all the techniques that you give to the couples who come to you to your own marriage? 17. Does being a marriage therapist put stress on your own marriage, or does it give you a greater appreciation of how good you have it in your marriage? 18. Is there a high divorce rate among therapists because they spend so much of their time helping others that they are emotionally unavailable in their own relationships? 19. I imagine that you hear and feel more than your share of negativity and hopelessness, therefore, how do you not allow that to spill over into your important personal relationships? Helping Your Family & Friends 20. I have a teen sibling with low self esteem. I am studying to be a therapist and have worked with troubled teens. When I talk to her about anything she shuts down because she thinks I am trying to "fix" her. How do you counsel your family members without them feeling like you are using the skills you learned for your job on them? Please fill out this Speaker Request Form to book Jonathan to offer this presentation to your group. Thank you. [table] Rating,The Good,One Thing Different,The Bad,eZine? Q: What questions would YOU like to ask about the field of MFT or what it's like to be a therapist? 10 years ago I never would've had clients in these states: Arizona, California, Colorado, Illinois, Kentucky, Michigan, Missouri, New York, Tennessee, Texas, Virginia, Washington AND these countries: Afghanistan, Canada (Alberta and Ontario), England, Mexico, Nigeria, Norway, ALL of whom I've been able to work with from the comfort of my own office and that they've been able to work with me from the comfort of their own homes or offices. In the past it was local or nothing. Now my clients can choose who they work with. They can have real "continuity of care" rather than hope they find a good therapist when they move (and as we know, most don't make that transition to a new therapist successfully, and more than often drop out of counseling altogether). They no longer have to start over with someone new and tell their whole story fresh again. They have the freedom of continuing the work they began. And new clients from these places get to access who they want to work with. It is truly making it more and more client-centered, which is what we believe in this field, but sometimes isn't realized. Technology is giving my clients more choice and with choice comes power. I am truly grateful for amazing technology and ALL the brilliant minds that have come together to make this all so "easy." Due props to all you awesome geeks and nerds out there! For my colleagues who desire to go out on their own into private practice, speaking business, etc. I highly recommend this GREAT article: How to Survive Your First Year as a Entrepreneur. Love it. Rings so true to my experience as an entrepreneur (minus the prostitutes). Great advice to anyone venturing into the fantastic world of entrepreneurship. By the way, you still might fail on that first business. But now it’s too late for you. You’re never going back to the pencil factory. You’re an animal, you hunt in the wild, you dig your sharp teeth into flesh and enjoy it, and at the top of the mountain you roar like a lion and everyone cowers in fear." Personally, there's no going back to the pencil factory for me (i.e., mental health agency or working for someone else in my case). LOVE working for self and CREATING!!! Tough, nerve-wracking, fantastic. If you've got the passion and heart to put yourself out there and aren't too risk-averse I highly recommend this crazy wonderful life. "As one of the 50 Best Careers of 2011, this should have strong growth over the next decade.... While some counselors focus on the behavior of an individual, marriage and family therapists go a step further, addressing mental-health issues within the context of the family. By counseling couples, families, or individuals, marriage and family therapists tackle a host of problems: adult schizophrenia, substance abuse, anorexia, and marital conflict. Today, marriage and family therapy is considered a "core" mental-health profession, alongside social work, psychiatric nursing, psychology, and psychiatry. More than 1.8 million people are now receiving treatment from a marriage and family therapist." [Read the full article here for more info on the field, pros/cons, average incomes (be sure to read the comments for some info on higher incomes, too), etc. Clients on Facebook? Okay or Not? Do you ever say yes to a client's friend request on Facebook? And if so what are your rules about it? I have some that want to keep in touch with me after I move but I am just not sure and don't want to make a bad choice but there isn't much said about 'internet' and 'Facebook' stuff?" A: Great question. Yes, I do. And yes, I know there's some controversy on this topic. I've read a lot on the subject and have given it a good deal of thought. Admittedly, for the field as a whole, this is still mostly uncharted territory. But it's one that isn't going away, and old school practitioners are going to find it hard to compete if they don't learn to adapt to where their clients are—which is where the market is. Greater flexibility and convenience in scheduling (just consider the convenience of a single mother or young couple not needing to arrange for a babysitter). Face-to-face cannot always provide for these three very significant factors. There are pros and cons for each method. I've always been an early adopter of integrating technology in our field as well as being a proactive marketer of wellness rather than passively waiting for clients to find me. I believe we as therapists have specialized knowledge and skill sets that are too important to just wait in our offices until people's problems reach the crisis point that they then start searching for a therapist. I'd much rather people get to know a good therapist long before they "need" one... Then when the need arises they don't have to scramble "hoping" they find someone that will work. The latter does not seem like good client care to me. Giving them the chance to pre-decide way ahead of time is much better for all as it insures a more proper "fit" with client and therapist which predicts greater successful outcomes for both. Contrary, to conventional practice (which some of the research now supports me) I do believe in a good deal of self-disclosure. Many clients over the years have expressed frustration that they want a great relationship with their spouse or kids but have never seen that modeled in real life. The medium of Facebook and appropriate self-disclosure provides that. I'm by no means THE model, but I am one very real life example of a guy doing his level best at practicing about 80% as a husband and father of what he preaches as a therapist. After all that, I re-read your question and realized I neglected to directly answer your first question. Yes, I do accept my clients "friend" requests (remember my caveat: I have a high-functioning clientele with good boundaries). I also didn't mention what is likely obvious: Most people don't consider Facebook "friends" to be the same as friends in the traditional sense unless their page is strictly limited to immediate friends and family. This is one reason I don't consider my client who is also my Facebook "friend" as being a dual relationship anymore than I would consider having a friendly conversation with a client I happened to meet at the grocery store a dual relationship. Now there may be others who will say you should never "friend" clients on Facebook. And they may be right depending on the population they work with or their own preferences. However, for me it's worked great. Client feedback is they value it. My approach has always to be client-centered and customer-driven. So, bottom line: I'm all about effectiveness. If it works keep doing it. If it doesn't, don't. A new, young and talented therapist in the field just passed his licensure exam and is going to be working with latency-age children. He asked for some literature and recommendations for working with this population. I LOVE to encourage and mentor the next generation of therapists, as I'm sure you do as well. I'm putting together a few notes, ideas and reading list for him and would value your recommendations as well (for him as well as for me). Just enter your recommendations in the comments below. THANK YOU FOR YOUR INPUT! While there are MANY things to learn and know about working with this age population, and MANY fantastic books, I would recommend the following as a crash course to cover some of the broad strokes. Knowing that there is limited time to get up to speed, the books with the *asterisks are the ones I would say are the essential first reads. These are all clickable links to Amazon so you can get them right away. First and foremost: If you're working with kids you're working with families. Learn how to do family therapy—learn how to get comfortable in the chaos that can come with working with multiple people and dyanmics in the same room. Family therapy is your friend. Embrace it. I am amazed about how many therapists have only had one family therapy class in grad school (and no further post-grad training) who then go on to provide family therapy. Yikes! Further, I've sadly been amazed how much corrective work I've had to do for parents and kids who've been to therapists who've done "family therapy" that really wasn't. There are SO many books in this area I could recommend, of course, but this is a 101 Crash Course list. *Family Therapy Techniques. You can't go wrong with studying the masters. This book is 30 years old and you'll be hard-pressed to find better. Minuchin was a family therapy pioneer. You would do well to study any of the family therapy greats: Whitaker, Haley, Madanes, the MRI Group, Milan Systemic, etc. 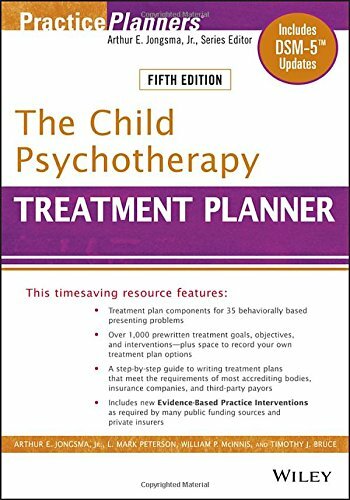 *The Child Psychotherapy Treatment Planner (Practice Planners) is a nuts and bolts idea-generator for when you are wondering what should I do with X situation? Handbook of Evidence-Based Treatment Manuals for Children and Adolescents is another great go-to guide for getting ideas and strategies and goes into more depth than the first one. I have the first edition. This link is for the 2nd edition published in 2008. Therapist's Guide to Clinical Intervention, Second Edition: The 1-2-3's of Treatment Planning (Practical Resources for the Mental Health Professional), is another great go-to-guide for "How might I approach X problem?" which covers many child/adolescent issues as well. *Play in Family Therapy, Eliana Gil. This was one of the best books I got in grad school that I devoured for ideas in working with kids in therapy of all ages. Parents are interested only so much in developmental theory and your assessment. What they really want is to know WHAT TO DO in real-life practical situations at home and in-the-moment. *Parenting With Love And Logic, by Jim Fay and Foster Cline. 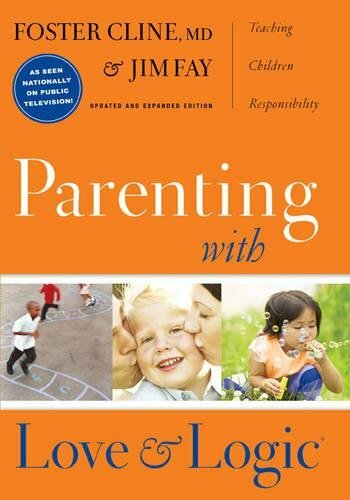 There are many fantastic parenting books out there. This one is worth it's weight in gold. 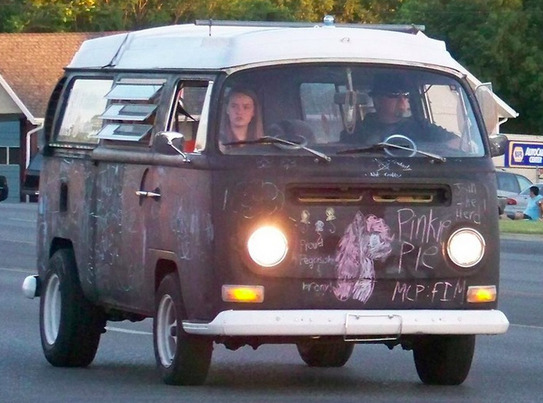 It's solid and practical and parent-friendly in a way that empowers both parents and children. It's easily taught and also deep. I encourage the parents I work with (and new therapists) to learn one book well rather than many poorly or half-way. This is also true for therapeutic models. It's good to be eclectic and open in therapy. But watered-down versions of solid, research-based models is NOT good for anyone. So for the parent and the therapist LESS IS MORE. I wish I got a kick-back from them--Heaven knows I've sold enough of their books over the years for them just by telling parents to go buy them. This is such a great in-the-trenches model developed by a school principal and child pscyhiatrist. 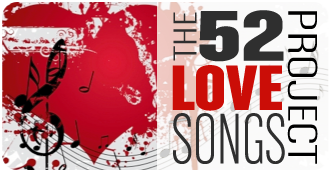 Free Love and Logic audios and videos. They are funny and practical. It's great to hear how L&L is actually applied in real examples rather than just reading about it. Plus Jim Fay is just funny and relatable in his delivery. 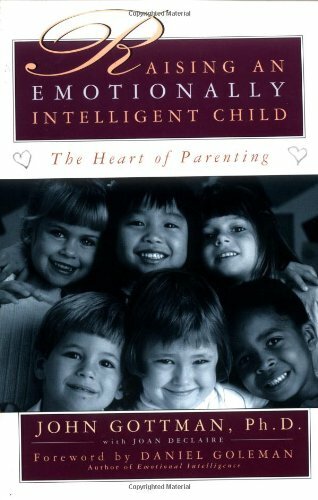 Raising An Emotionally Intelligent Child The Heart of Parenting, John Gottman. Gottman was talking about emotional intelligence way before it became a buzzword. Classic solid Gottman stuff. 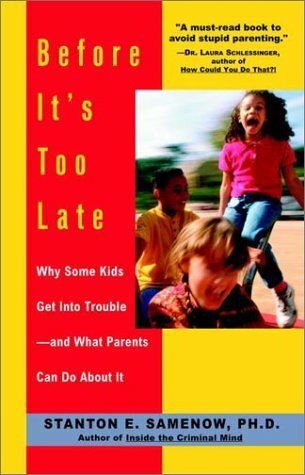 Before It's Too Late: Why Some Kids Get Into Trouble--and What Parents Can Do About It, by Stanton E. Samenow (pronounced sam-uh-naw) is a fascinating book by one of the leading clinical forensic researcher written for parents on how to catch and correct anti-social behavior "before it's too late." I taught the State's mandatory divorce parenting class for over a decade. I'll send you my handout packet I used for that. Teach the importance of co-parenting. 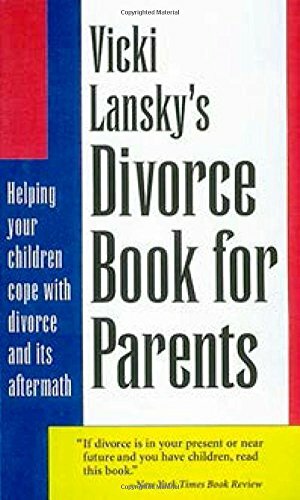 *Vicki Lansky's Divorce Book for ParentsVicki Lansky's Divorce Book for Parents: Helping Your Children Cope with Divorce and Its Aftermath (Lansky, Vicki), I used this for years as the book for my divorce education class. Great, quick reference stuff. 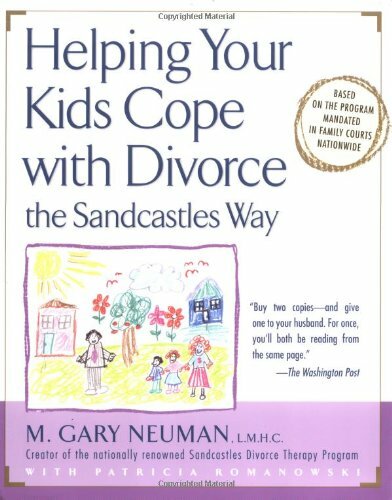 Helping Your Kids Cope with Divorce the Sandcastles Way, M. Gary Neuman with Patricia Romanowski. This is a more in depth book than the above. Both offer great info and strategies for kids and fams. Stepfamilies are THE most common family form. Learn stepfamily dynamics. If you don't know stepfamily dynamics (I'm amazed how many therapists don't!) then how will you be able to help the kids and parents you work with navigate a stepfamily successfully? [I do a workshop on this. Give me a call and we can set up a private training if you like on this or any of these areas). 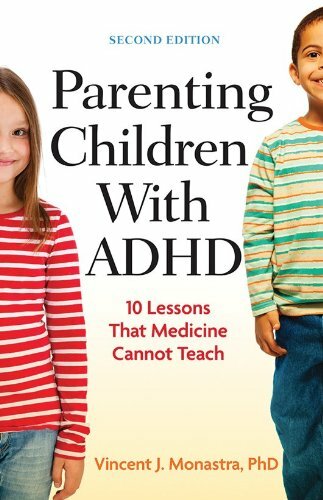 I'll send you my draft of my upcoming book: 125 Alternate Solutions to Managing ADHD. This is available as a workshop as well. See the Parent Training section on the Seminars page. I also teach a Study Smarter, Not Harder: Effective Learning Strategies for teachers, parents and students. You'll certainly be dealing with many bright kids who don't think they are bright because they've never learned how to succeed in school. Arizona, California, Colorado, Illinois, Kentucky, Michigan, Missouri, New York, Tennessee, Texas, Utah, Virginia. Telehealth (or remote therapy as I call it) is a fascinating advancement in my field and I'm glad to have been an early adopter. Amazing how technology is helping bring more help to more people, give clients greater choice over their care instead of just "taking what they can get." Someday I'll post the interview to further illustrate the pros and cons, some considerations on how to do it effectively, etc... or make it into an FAQ for clients. 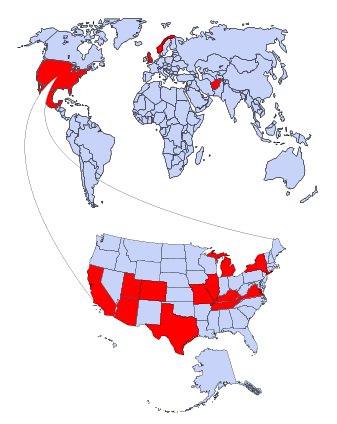 Note: This map should show Canada highlighted (I've worked with clients in two provinces there). Among the many things we talked about in today’s Networking Group, Mark mentioned a book that sounds promising: Be a Wealthy Therapist: Finally You Can Make a Living While Making a Difference (http://www.beawealthytherapist.com). He'll be reading it and sharing his take on it with us. One idea he shared was: Try to imagine what it is that wakes your clients up at 4 o'clock in the morning. That becomes your catch phrase for your practice, website, marketing materials etc. He gave the example of Julie de Azevedo-Hank's (http://www.juliehanks.com) use of this idea with their successful Wasatch Family Therapy (http://www.wasatchfamilytherapy.com) practice. You can visit her sites and see what we mean. I love that idea, and wished I had heard of that years ago when I was trying to figure out my approach as I would've been able to nail down my message a lot sooner. The basic idea is to them how you will answer their pain, not tell them about what you do or about yourself. For example, in my case, instead of "I do marriage counseling" (yawn), "I help people not only save their marriages, I help them create phenomenally GREAT relationships." (Wow!) 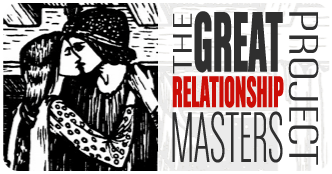 My tagline is "Create GREATness in Your Relationships". Another example: While Julie treats depression and women's issues she doesn't lead with that. Her sites proclaim, "Healing relationships" and "Let your best self shine." In all of these examples people want to hear the solution to their pain and beyond, not just that you will treat their pain. We'd all love to hear your practice building ideas. What do you do that's working for you in your practice? Ongoing training. Stay sharp through research, education, colleagues, in-services, reading, etc. Innovation. What new and different ways are there for you to leverage your skill sets? Jonathan, for example, does business management consulting with the unique psychological and systemic understandings that only an MFT can bring to an organization. Jonathan also markets himself as a relationship strategist instead of a counselor or therapist because there are lots of therapists but how many “relationship strategists” do you know? That gets people thinking. Effectiveness. Track results and outcomes. Jonathan actually offers an unheard of money-back guarantee for his marriage transformation work. Go to business workshops in the business community. NSA, etc. Not “just” a therapist. Take pride and ownership of the unique knowledge and skillsets you possess. Say “yes” when asked, “Can you _________?” whether it’s a speaking engagement, new project, etc. Wayne Dyer’s story on grants. Pablo Picasso qoute. How I became a bullying prevention and intervention expert. “When I don’t know how to do it I give it to someone else. I have a lot of friends.” —Owner of a successful janitoral business. Do columns for local churches’ monthly newsletters. Radio talk shows, PTA meetings, speak for organizations monthly meetings. 5x/mo meet with the Top 5 potentials face to face. 5 different ways get your name out in the community: Biz, workshops, column, etc. Take care of your referal sources. Call and thank and give feedback and anything you want me to do? and send thank you notes. Getting ref sources: answer your ref sources pain vs. telling them about you. People don’t know I’m there if I don’t tell them. website and drive to it! What do you like/dislike about your work in private practice? Things you wished you had known? I had a community MH background and didn’t know how to attract high-functioning, high-paying clients. Never saw myself as a “money-grubbing souless business person.” It wasn’t until I realized that I could help more people by doing a sound business plan than by avoiding intelligent business practices. Pam King compiled these “Tips From the Field” from the above panel members. Establish a good consulting group. If you practice in isolation you are putting yourself at risk as well as limiting your potential therapeutic impact. Embrace "failure" learn from it. Be flexible while maintaining the boundaries that are necessary to keep yourself healthy and assist your clients in the process. Embrace the seasons of your personal/family life as you make business decisions. Remember you are running a business (with all kinds of business expenses); don't apologize for requesting payment for your services! Be able to offer clients the use of a debit/credit card machine to make payment easy for them. Develop a business mindset and diversify your income streams. Change how you think about the money you spend on advertising-a $500/year ad in a phonebook or Psychology Today will be made back in one client in a few sessions, and everything after that is pure profit! Get a business card right away so you have something to leave with new referral contacts. Identify your main referral sources and market to that audience.